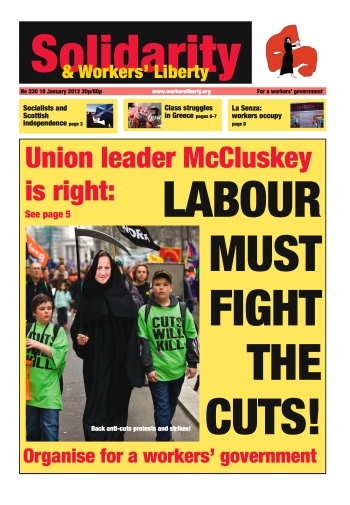 Make Labour fight the cuts! Secretary of State for Work and Pensions, millionaire Iain Duncan Smith, has pledged to cut the cost of benefits for disabled people by 20% — one of the “reforms” embedded in the Welfare Reform Bill. The House of Lords recently voted down some of the measures relating to disability benefits on the grounds that they are arbitrary and gratuitously mean. Quite right! The causes of the tragic capsizing of the cruise liner Costa Concordia will hopefully soon be found. But seafarers and their unions around the world have been warning about the safety standards on board ships for years. By those accounts ships at greatest risk are those that sail under a "flag of convenience" (the practice of registering a merchant ship in a sovereign state different from that of the ship's owners). This avoids complying with the more stringent safety and training regulations imposed on ships registered in more economically developed countries. Trade union militants across the labour movement are fighting to rescue the pensions battle from sell-out. Activists in Unite are fighting to hold their national leadership to account and demanding that they uphold the policies of the union’s National Industrial Sector Committees (NISCs), which have voted to reject the government’s offer and organise further action. Central Foundation Girls School (CFGS) in Tower Hamlets, East London, has triggered a significant confrontation with trade unions in the borough by announcing a restructure which could see 13 workers lose their jobs and large numbers of support staff face pay cuts. Doncaster council has approved a 4% pay cut for all non-teaching staff, affecting 7,000 workers across the authority. Unison, which organises local authority workers, is already planning a fightback. Branch secretary Jim Board said: "These plans mean a large number of our members are going to suffer quite a severe pay cut on top of an already falling standard of living. "We are preparing a ballot and are recommending our members do not accept the pay cut. If they reject it and the council goes ahead then there is a very real threat of industrial action." Following a disciplinary hearing last week, Duston School National Union of Teachers rep Pat Markey, a humanities teacher with 18 years service, was told of his dismissal by phone from his area union office. Management at Duston School clearly lacked the decency to inform Pat about his “summary dismissal” in person. Pat is “guilty” only of opposing Duston School becoming a Foundation Trust School and now an academy, and guilty of trying his best to defend working conditions so that both staff and pupils can work and study in reasonable conditions. Stagecoach bus drivers in South Yorkshire struck again on Monday 16 January after overwhelmingly rejecting bosses’ latest offer in a long-running pay battle. Workers voted by 206 to 89 to reject the offer and continue fighting. Stagecoach are mounting a desperate strike-breaking operation, attempting to bribe Stagecoach workers from around the country (allegedly from as far afield as the Isle of Skye) to come to South Yorkshire to drive scab buses. La Senza workers are occupying one of their company’s stores in Dublin’s Liffey Valley shopping centre as bosses attempt to make workers pay for a downturn in company fortunes. Lingerie retailer La Senza went into administration in December and has sold off several of its outlets. Workers fear that they won’t receive overtime payments for December, and occupiers have accused management of using administration as a “smokescreen” to restructure the company and make workers redundant. Over 1,000 La Senza workers have already lost their jobs. Unite will re-ballot its members at Balfour Beatty Engineering Services in attempt to defeat the Building Engineering Services National Agreement (BESNA), the new collective “agreement” being imposed on mechanical and electrical construction workers by Balfour Beatty and six other major construction contractors. A previous strike ballot returned a majority for action, but electricians were forced to strike unofficially after Unite cancelled the strike following legal threats from BBES.